Terra cotta toy carts from the Harappan period site of Nausharo in Baluchistan. 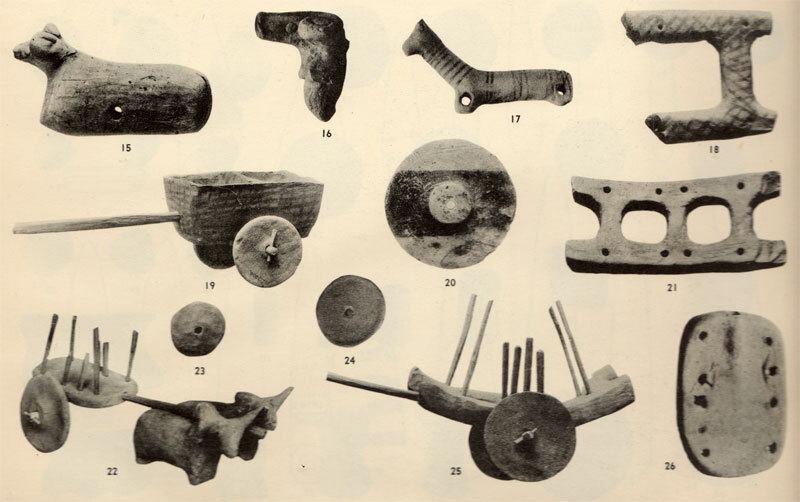 "The most important [ancient Indus] crafts were in the fields of textiles, ceramic manufacturing, stone carving, household artefacts such as razors, bowls, cups, vases and spindles, and the production of jewelry, statuettes, figurines and children's toys, some of which were mechanical in function. This last category of goods is perhaps the most reliable evidence of the of the sophistication of this society" writes Burjor Avari (India: The Ancient Past, Routledge, London and New York, 2008, p. 46). 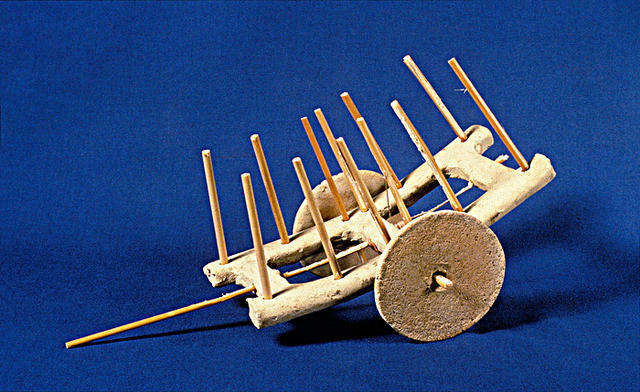 "To judge from the number of wheels and broken frames that have been found, toy carts were extremely popular playthings at Chanhu-daro. They seem to have been made as easily as they were broken, and fragments were brought in on most days by our workmen, though few of the frames could be put together or even satisfactorily restored; only two were found unbroken (Pl. LVIII, 19, 21, 22 [Image 4]). Indeed, the pieces were mostly so small that one could only suppose that once the toys were broken they were used for other games until they became so fragmentary that all interest in them was lost. Owing to their solid construction the wheels had rarely suffered much damage." "The most unusual cart-frame was the type illustrated in Pl. LVIII, 21 . 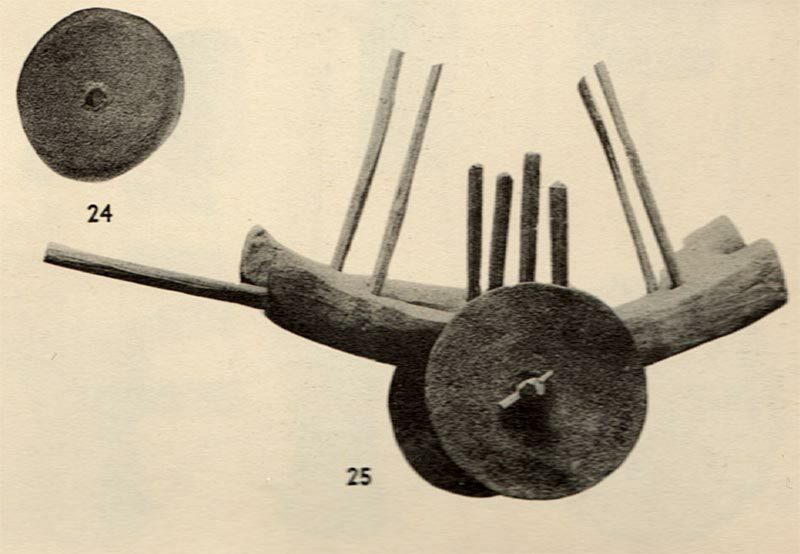 It was strongly made of pottery with four vertically pierced holes on each side to take stakes of wood, exactly as in the little farm carts used in the present day in Middle and Upper Sindh. The four holes in the middle took longer stakes projecting from the underside of the frame in pairs, between which the easily removable axle of the wheels was held. There were also horizontal holes for the shaft through one end of the frame and the middle cross-piece. A reconstructed cart of this type is seen in Plate LVIII, 25 , though the wheels with it where not found with this actual frame. With a floor of matting or a ropework net, the open frames of these cars were well adapted for carrying agricultural produce, such as straw, hay, and the like, which the uprights would have kept in place. On No. 18 in Pl. LVIII a meshwork of lines of red paint indicates a net in position." Ernest Mackay, Chanhu-daro Excavations 1935-36, p. 162. 3. 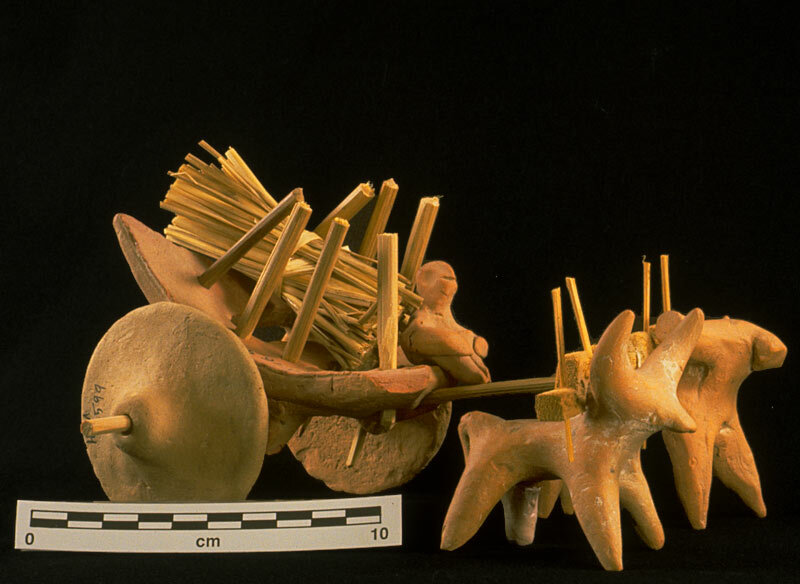 Terra cotta toy carts from the Harappan period site of Nausharo in Baluchistan.